As a project planner, you can inform project resources about assigned work packages and about the changes in project. For more information on how to assign a resource to a work package, see Add resources. Find the detailed description of these types below. You will get the message InLoox notifications after you have chosen InLoox PM as notification type. The reminder for the new work package(s) will be displayed in the top right-hand corner of the home page. Click it to open the InLoox notifications dialog box. This information is delivered from the project planning. Change the status, if you have already done this task. InLoox PM Web App keeps this information synchronic with the planning and displays a completed planning element with the green check mark. You can also open the related project by clicking Open Project. The notification type is selected by the project planner. Users without InLoox PM Web App or InLoox PM for Outlook can only be informed via task request, meeting request or email. The project planner can also decide not to inform the resource. You will get an E-mail after you have chosen E-mail as notification type, for example with the subject "New element (Strategic Project #2007-0002) : Max Smith (msm@test.com)". 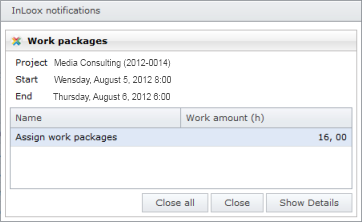 You can open and edit this work package only in InLoox PM for Outlook. The sender is the project director. Accept and create an entry in your calendar or task list manually. Decline and reply in free form in an E-mail. You will receive a task in your Outlook task list after you have chosen an Outlook task request as notification, for example with the title "New element ( Strategic Project #2007-0002) : Max Smith". The sender is the project planner. Enter a value in the Status, Priority and % Complete fields. You can also create a reminder for this task. Delete a task or mark it as completed. You will get an appointment after you have chosen Outlook appointment request as notification type, for example with the title "New element (Strategic Project #2007-0002) : Max Smith". Sender is the project planner. Create a reminder or change other options in the Outlook appointment. Decline or delete it from the calendar. How to show and edit work packages | InLoox PM 7 Web App • Copyright 1999-2019 © InLoox GmbH. Tutti i diritti riservati.